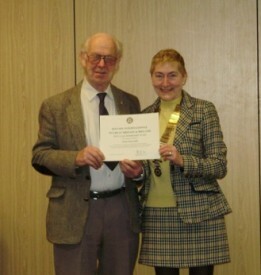 At the last meeting of Warwick Rotary Club, President Jackie Crampton had the great pleasure of presenting a 50 year long-service award to Rotarian Paul Reynolds. Paul, a retired farmer, joined Rotary on 27th January 1965 and thus celebrated 50 years of unbroken service to an organisation close to his heart. A quiet man, he has not sought high office but has always been an active member on committee work, and together with his wife, Janet, has been a very visible presence at any event organised by the club.